The ship arrived at Stockholm, June 30, horses unloaded and taken to the military stables of one of the artillery regiments. Here we found conditions most excellent and everything possible was done by the Swedish officers to make officers, men and horses comfortable. Forage and stabling was of the best, and the former far superior to that which is obtained in our country. The competitions were to start on July 13, thus giving us thirteen days to get our horses into condition for these severe tests. We found the horses very soft after their trip and capable of doing nothing but slow work for some days. This we tried to make as hard as possible by climbing hills, going through mud and various things to gradually draw out and harden the muscles. Each nation was allowed to start four competitors; the scores of the three highest competitors upon completion of the test counted as the team’s total. Russia, Chile and Norway withdrew from the Military test, while Belgium, Denmark and Great Britain failed to complete the test through falls, faulty riding of the courses, injury to horses, etc. Captain Henry rode “Chiswell,” Captain Lear, “Poppy,” Lieutenant Montgomery, “Deceive,” and Lieutenant Graham, “Connie.” Each animal was required to carry 176 1/2 pounds weight. Three days before the competition commenced, all competing officers were taken out and shown the cross-country course. The open part of the course was plainly laid out by flags, while a section through some woods was marked by ribbons. The following day the team inspected the long distance course by automobile. We found the course to be over very hard Macadam roads, with many places filled with small stones. The cross-country course, which started after some 20 odd miles of the long distance ride had been ridden, was a reasonably hard test for a good military horse. There were about twenty obstacles in all, probably half of which were small ditches. The first obstacle was a three and one-half foot fence with about a five foot ditch on the near side ; it was at the foot of a slight decline and approached rather suddenly. Many penalties were given at this jump. Another similar obstacle was near the finish of the course but the fence was not quite so high and the approach was very good. Among the other serious obstacles were three large ditches and an “in-and-out” over Swedish fences. These ditches were from 12 to 15 feet in width and with poor approaches. The bottom of one of the ditches was filled with plank, which frightened many horses and caused quite a number of refusals. At the end of the cross-country run Captain Henry found that his horse had lost a shoe. The delay in reshoeing made it necessary for him to gallop the remaining twelve miles of the long distance course. Prior to the day set for the first event we had decided that in each hour of the long distance course the horses should be ridden 18 minutes at the walk, 18 minutes at the trot and 18 minutes at the gallop. This allowed a rest of six minutes in each hour. However, after finding what the course was to be. the hard Macadam roads with the heat of the day. 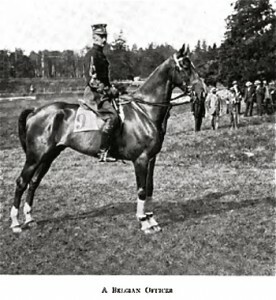 Captain Henry instructed the team to ride the greater part of the course at the trot, and to dismount and lead the horses five minutes before reaching the cross-country course. The day was exceedingly hot, and both Captain Lear and Lieutenant Montgomery lost over five pounds in weight during the ride. The American officers completed the long distance ride and cross-country course with from nine and one-half to three and one-half minutes to spare. Our horses were in good condition, but tired. All horses were washed off with hot water and alcohol, and then all their muscles massaged with alcohol and witch hazel three times during the afternoon and evening. Bandages containing a cooling lotion were placed on all of the legs from the knees and hocks down, and the horses stood in cold water. Great care was taken in the watering and feeding. The first watering and feeding was given about an hour after the massaging, and consisted of but a few swallows of water and one pound of grain. Two hours later they were again watered and fed, this time receiving about twice the amount of water and grain. The next morning we found our horses pretty stiff and sore in both legs and feet. Connie was in the poorest condition of any of our horses, while Deceive was hardly affected. Chiswell and Poppy showed the hard work, but not so badly as Connie. Fortunately this was a day of rest. The horses were led at a walk for half an hour in the morning and afternoon, and there was a continuation of the massage, bandage and water treatment. The animals were also re-shod, as most of the shoes had been worn almost as thin as paper by the hard Macadam roads. The horses of other nations also suffered from the heat and excessively hard roads. A French horse was nearly dead when it reached the stables at the end of the first day’s work. After the day’s rest referred to the riding over the steeplechase course was held. In this the various riders rode over the course separately against the maximum time allowance. The same weight, 176 1/2 pounds was required to be carried. The day was very hot, and most of the horses showed more or less signs of exhaustion upon completing the test. The American team had carefully laid out the exact points which they should reach at the end of each minute’s riding, and carried stop watches on their wrists where they could be easily seen, and tried to ride accurately according to time. The result was that all completed the test within the prescribed time and with their horses in very good condition, although stiff and sore from the preceding tests. In this test England was eliminated from further participation by one man falling and being too seriously injured to continue, and another man being disqualified for passing on the wrong side of one of the marking flags. The other nations with the exception of Germany and Great Britain, completed the test with perfect scores, one German and two Englishmen being penalized for not arriving within the maximum time allowance. The same treatment as to massaging and so forth was given the horses upon the completion of this test, and continued until the next day for Test 4, which was the jumping of obstacles shown in the plan attached. These obstacles were placed in the Olympic Games Stadium and were beautifully constructed and the whole of the surroundings magnificent. Everything connected with the horse-riding competitions was handled by the Swedish Army in a perfect manner. In the fourth competition, the following nations entered: Sweden, France, Germany and America. Great Britain. Belgium and Denmark having been eliminated. 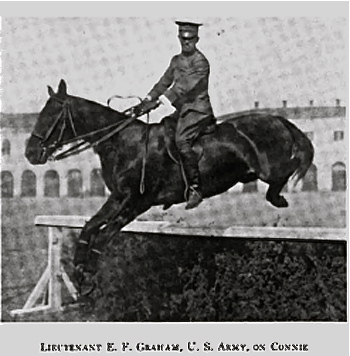 Lieutenants Graham and Montgomery each made nine faults. Captain Henry thirteen faults and Captain Lear fourteen faults. The close of this test found Germany in first place with 118.20 points for the team, America second with 117.19 points, Sweden third with 117.07 points and France fourth with 115.69 points. The best individual score in this event was made by Lieutenant Casparrson, a Swede, and contained five faults. Most of the faults made by the various riders were at obstacles Nos. 4, 8 and 14, one hundred and twenty-five points being lost at these jumps. On the last day of the Military event came the prize riding. The Americans had spent a great many hours in training their horses and they hoped to do well in this event. The horses were to be shown “standing at attention, at the walk and the trot, turning on the haunches to the right and left about at the trot, backing from the trot, turnings of the forehand from the trot, collected and fast trots, the gallop from the halt, walk, trot, and backing, with either lead ; galloping on small circles, changes of lead, halt from the full gallop, etc.” Our horses did their work well and we felt that we had at least held our place. The rules governing this event said: “For riding by holding the reins in two hands the highest number of points is 7. 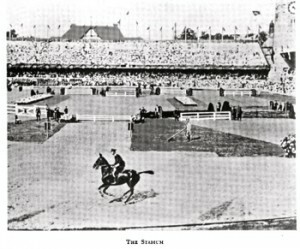 For riding holding the reins principally with one hand the point can be added for walking and trotting with 1 and for gallop with 2 further points.” The American riders held their reins in one hand in all their schooling, while the three Germans having the highest scores of their team rode with the reins in both hands. Thus, we counted on gaining nine points over the German team. 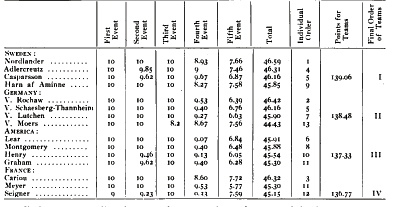 However, the inferiority of horses evidently caused the judges to give us a very low mark, for when the final decision was announced Sweden was first, Germany second, America third and France Fourth. Still, we were mightily pleased to be placed, and felt that the five months of very hard training we had gone through had been well repaid. Besides the military competition there was prize riding competition and the prize jumping competition for individuals and for teams. In the prize riding competition Captain Henry and Lieutenant Montgomery entered with Chiswell and Deceive. Chiswell put up a remarkable performance and his rider was heartily complimented by many present upon the work done. However, the horse as an animal did not rank with the magnificent animals entered in this competition by Germany and Sweden, the result being the Swedes won the first three places, Germany the next, Sweden two more and America thirteenth out of twenty-one entering. The next competition was the individual prize jumping. 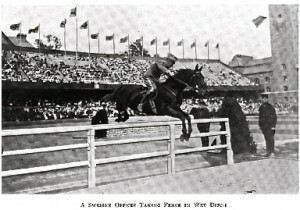 In this the United States entered no horses as they could hardly compete as individuals over a more difficult course than the military with the great jumpers ofEurope, especially as these great jumpers in most cases were fresh and had not been through the military contest. The competition was won by France with Germany second and Belgium third. The next competition was prize jumping for teams of four each, the highest three to count. With the exception of the Americans all the other nations had four riders on their teams. This required our team of three to compete against the selected scores of three riders out of a team of four. The United States entered this with Connie ridden by Captain Henry, Poppy by Captain Lear, Deceive by Lieutenant Montgomery. None of these horses had ever jumped this more difficult course, as we had always attempted simply to train them for the course as laid down in the military competition. We were unable to enter the fourth man as we did not consider that we had a fourth horse capable of going over this course. However, we more than surprised ourselves, for we held third place in the competition until the last horse had jumped. In this the American horses went over with Deceive, ten faults, Connie sixteen, Poppy seventeen, a total of forty-three. The total faults of the best three horses of the other nations being Sweden, twenty-five; France, thirty-two; Germany, forty; United States, forty-three; Russia, fifty; Belgium, sixty; Chile, Great Britain, Norway and Denmark not entering teams. This completed the horse riding competitions. 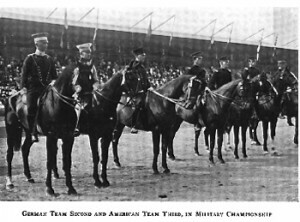 In addition to these the members of the various nations went in the Stadium on several occasions for presentation to the King of Sweden display of horsemanship and the presentation of the medals to the winners.